Rotterdam, April 9, 2017 – Architects are still in the lead when it comes to the design of a building, but BIM developments affect this in such a way that architects need to collaborate more and more with other parties involved. These developments also have influence on the way of designing. 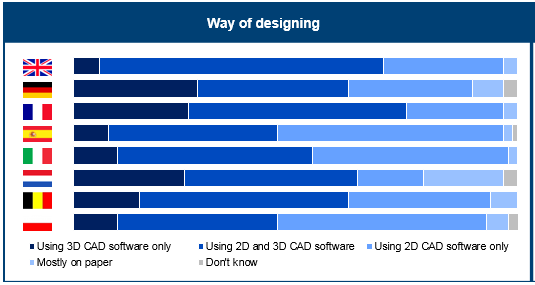 In the Q4 2017 report of the European Architectural Barometer of USP Marketing Consultancy, 1,400 architects were asked what kind of CAD software they use. 2D CAD and 3D CAD software are most often used by architects and only a small part of the European architects still work mostly on paper. The European Architectural Barometer is a study by USP Marketing Consultancy, which is based on app. 6,400 successful interviews with architects in eight European countries annually. Every quarter, a report is published covering a specific topic like BIM, prefabrication, media orientation of architects and many more. The report also provides future building volume predictions, based on the orderbook development of architects and other economic indicators in the construction sector. USP Marketing Consultancy is a leading international market research agency that is specialized in the construction, installation and DIY sector for over 25 years. USP Marketing Consultancy works for internationally renowned companies (such as Knauf, Xella, VELUX, Saint-Gobain, Rockwool, Vaillant, Grohe, etc.). 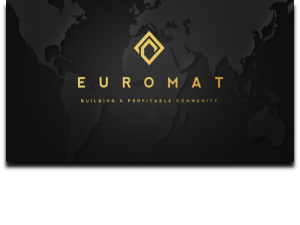 Our clients often have pan-European questions about their brand awareness, customer journeys, market opportunities, e-commerce trends and other research needs. USP Marketing Consultancy delivers the insights to make decisions and acts as like marketing advisor for its clients.